French town, in the department of Seine-et-Marne. Jews were settled there as early as the twelfth century. Thibaut, Count of Champagne, made an agreement with Provins in 1230 in which he reserved to himself all rights over the Jews of the town. In 1298 or 1299 Hagin, a Jewish resident of the town, was commissioned to deposit in the hands of the royal officials the proceeds of the taxes paid by his coreligionists of the bailiwick of Troyes. In 1301 Simonnet and Vivant, sons of Simon the Jew, sold to Perronelle, widow of Jean de Joy, goldsmith, for the sum of 21 livres of the currency of Tours, one-half of a piece of land situated in the Jewish quarter of Provins, above the Porte Neuve, and bordering on an estate belonging to the Jew Hagin Dalie. A document of 1313 mentions the sale by Maitre Pierre d'Argemont, clerk, for the sum of 400 livres (Tours currency), of a house which had belonged to the Jews Josson de Coulommiers and his son Croissant, adjoining the enclosure of the chateau and surrounding the Jewish school. 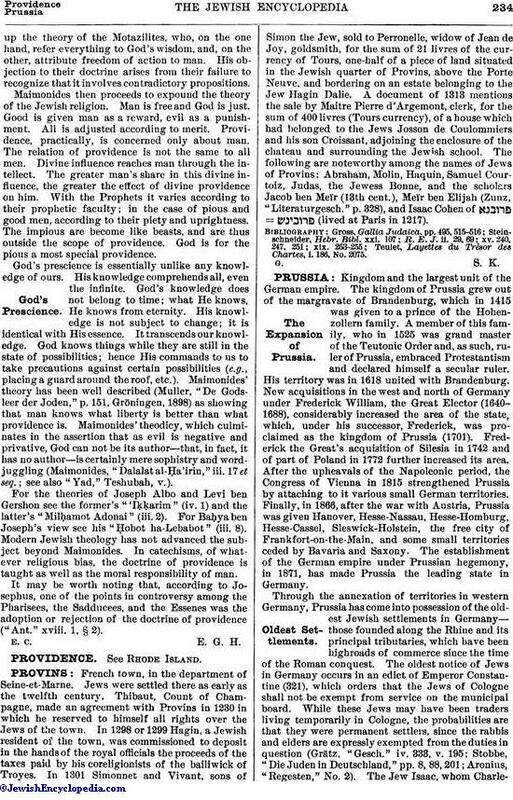 The following are noteworthy among the names of Jews of Provins: Abraham, Molin, Haquin, Samuel Courtoiz, Judas, the Jewess Bonne, and the scholars Jacob ben Meïr (13th cent. ), Meïr ben Elijah (Zunz, "Literaturgesch." p. 328), and Isaac Cohen of = (lived at Paris in 1217). Teulet, Layettes du Trésor des Chartes. i. 186, No. 2075.